It's All Just a Show...Right? 'This is an authentic old west ghost town, son. Around these parts the dead don't stay dead.' 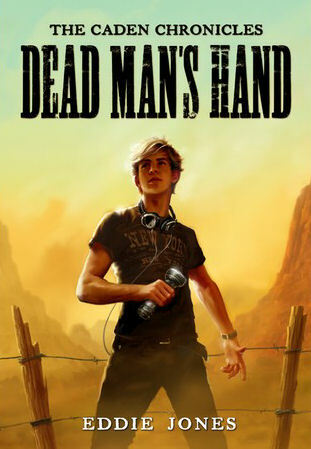 Nick Caden's vacation at Deadwood Canyon Ghost Town takes a deadly turn toward trouble when the fifteen-year-old finds himself trapped in a livery stable with the infamous outlaw Jesse James. The shooter whirls, aims and... vanishes. Great theatrics, Nick thinks, except now he's alone in the hayloft with the bullet-riddled body of Billy the Kid. And by the time the sheriff arrives, the body disappears. Soon Nick is caught in a deadly chas---from an abandoned gold mine, through forbidden buffalo hunting grounds, and across Rattlesnake Gulch. Around every turn he finds another suspect. Will Nick solve the murder? Will his parents have him committed? Or will the town's infatuation with Hollywood theatrics conceal the real truth about souls, spirits and the destiny that awaits those who die. This was an exciting murder mystery book for middle grade readers. It takes place in a staged"Ghost Town" but it seems like a very real murder has been comitted. Teenager Nick seems to be the only one who believes there is a real murder to investigate, and with real gusto he devotes himself to the task of bringing light to the mystery. He has the help of a girl called "Annie Oakley", but halfway down the road he begins to wonder, is she really on his side? The suspence and the mystery was decent in this book, and the plot moved along well. I would say this is a book for boys, or for girls who like adventure. It is published by Zonderkidz, but there is whatsoever no mention of God in this book, except perhaps at the very last paragraph, which, by the way, left me completely hanging and wanting to read the next book in the Caden Chronicles, like NOW. It will come out sometime at the end of November. I received this book from Fever Pitch Reviews in exchange for an honest review.